The first national Thanksgiving Day was originally created by George Washington to give thanks for the Constitution. 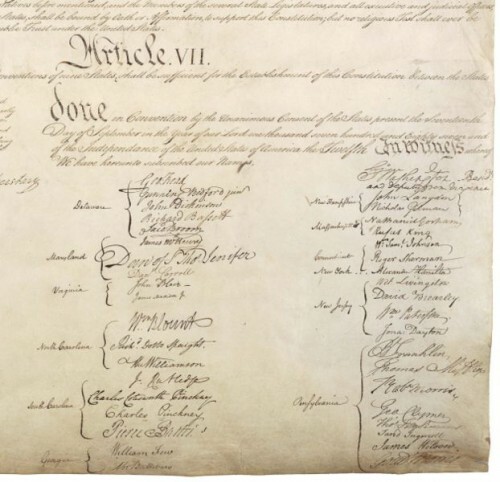 The U.S. Constitution is the oldest and shortest of all the national constitutions. Benjamin Franklin was the oldest delegate. He was 81 years old at the time. When Pearl Harbor was bombed, the Constitution was moved to Fort Knox for safekeeping. Now it is at the National Archives in Washington, D.C. There have been 27 amendments to the Constitution out of the more than 11,000 that have been introduced in Congress. This entry was posted in Constitution Day, FREE online Games & Lessons, History, Social Studies, Teaching History, Teaching Social Studies by Teacher Tips. Bookmark the permalink.